It seems crazy to say this, but we're at that point of the year where Easter has become a (not-so-distant) memory. The ham has been sliced, the Cadbury eggs have been demolished, and the Easter Bunny has gone back into hiding for another year. (Where does the Easter Bunny actually live between holidays? Does anyone know?) If you're already missing the season of pastels and egg-shaped confections, fear not: you get another chance! While Western churches celebrate Easter on the first Sunday after the vernal equinox, Orthodox faiths follow the Julian calendar, and this year, Greek Orthodox Easter falls on April 8th! Here to help you plan your Orthodox Easter menu is our beloved Greek mezzo-soprano, Stephanie Chigas! Years at the Met: 8. My favorite opera is: I have 2 favorites: Così fan tutte and Werther. One of my most memorable experiences at the Met so far is: Dmitri Hvorstovsky’s surprise performance at the Metropolitan Opera’s 50 years at Lincoln Center Gala Celebration last spring. Other than opera, my favorite type of music is: All kinds! I am obsessed with the 80’s and Christmas music, and I absolutely LOVE the Beatles, Elvis Costello, Olafur Arnalds, and Radiohead. I also like early jazz, gypsy jazz and mellow indie music. When I’m not at the Met, you can find me: At home in Astoria, watching "Golden Girls" marathons or cooking with my daughter, Zoe. The most outrageous thing I've ever cooked (or eaten) was: I once made a turducken for Thanksgiving. It is a turkey stuffed with a duck that is stuffed with a chicken. I don’t recommend it. It was a pain to assemble and in the end it just felt very weird to me. The three things in my kitchen I can’t live without are: My wooden spoon that I’ve had as long as I can remember that I use for almost everything; my coffee pot; and my manual pasta maker. If I had to choose, my three (current) favorite ingredients are: Butter (a close tie with olive oil), mushrooms of all varieties, and tarragon. Again, if I had to choose, my “last meal” would be: My last meal would be what I like to call the "Trifecta of Deliciousness,” which is a slice of Chicago style pizza, a Chicago style hot dog, and an Italian Beef sandwich with giardiniera on the side. "My dad was a chef and restaurateur, as is my one of my sisters, and my mom is a phenomenal home cook, just like my Yiayia (or grandmother in Greek). So naturally, they instilled in me a deep love of cooking, sharing traditions, eating, and having fun with family and close friends. I love that I am passing this down to my daughter and seeing her love for cooking grow, too. It is my absolute favorite pastime (aside from watching "Golden Girls"!). 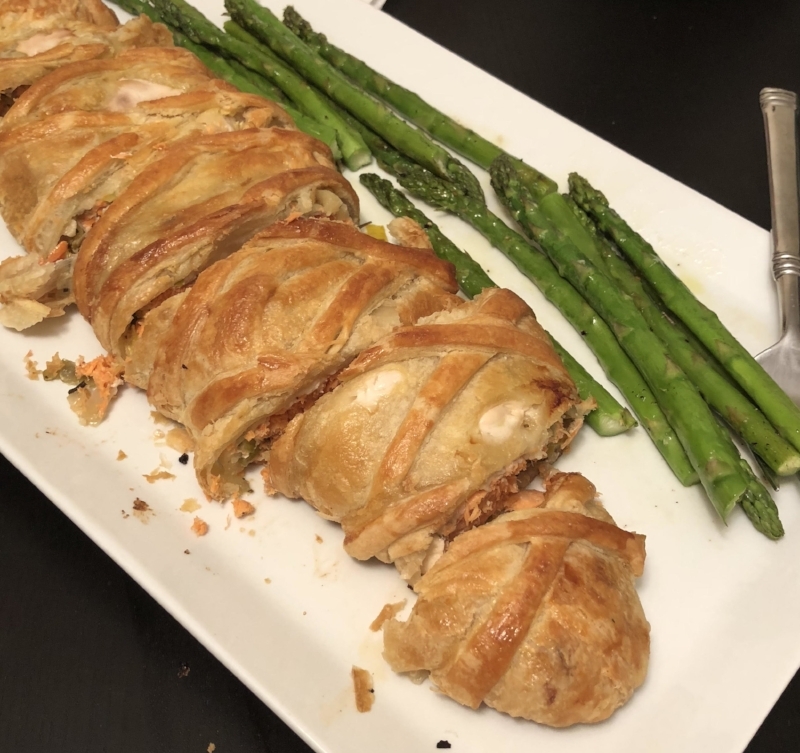 That being said, spring is here and Easter is right around the corner, so I’d like to share one of my favorite dishes that I make often this time of year: Salmon En Croute. It’s light and springy, but can be enjoyed at any time. It goes best with great company! Melt the butter in a large skillet over medium heat. Add the leeks, red onion and tarragon and sauté until the onions and leeks are soft, which should take about 10 minutes. Add the wine, raise the heat to high, and bring to a boil. Let the liquid cook off, add the salt and pepper, and remove from the heat and set aside. Let this cool before using. Unfold 1 thawed pastry sheet and lay it on a lightly floured surface. Brush 1 edge with the egg wash and overlap the other sheet by 2 inches. Roll the pastry out until it's big enough to fold around the salmon. Spoon the cooled leek mixture down the center of the pastry, place the salmon on top of the leeks and fold the pastry over the salmon. I like to shape the pastry around the salmon so it looks like a fish. :) Egg wash the edges to seal, and press firmly. Place the salmon parcel seam side down on a sheet pan. Brush with egg wash and place in the oven for 30 to 40 minutes, until the pastry is puffed and golden brown. Remove from the oven and let sit for 15 minutes before slicing. I like to serve this with some grilled asparagus and Dijon mustard. Enjoy!" Stephanie's finished creation! Photo by the chef herself.